In 1969, Taban lo Liyong declared Uganda “a literary desert”. In 2013, Oscar Ranzo and a growing number of Ugandan authors would beg to differ. 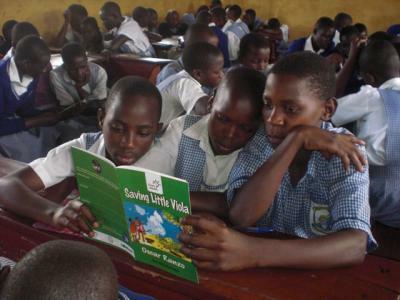 Students at Bukaya Primary School in Njeru, Buikwe district, in Uganda’s central region, reading Saving Little Viola, written by local author Oscar Ranzo. Credit: Oscar Ranzo. The heroine of The Little Maid, Viola, is an eight-year-old Ugandan girl who lives with her destitute grandmother and dreams of going to school. Instead, she is sent to live with her aunt, who promises to pay her school fees if Viola works for her first. Viola becomes a maid, forced to wash clothes, scrub the bathroom, cook and live in servants’ quarters. But every day when her cousins’ tutor arrives, she crawls underneath the dining room table to eavesdrop on the lessons. Eventually Viola learns to read and write and escapes the clutches of her evil aunt, who is found guilty of child abuse and child slavery and ordered to school her niece. It could be a true story. In Uganda there are an estimated 2.75 million children engaged in work, although not many of those will have the happy ending. But The Little Maid is a work of fiction, written by Oscar Ranzo, a Ugandan social worker turned author who has penned five children’s books. Now, The Little Maid is being distributed to schools across the country low-cost (5,000 Ugandan shillings or $1.90 each) through his Oasis Book Project. The project aims to improve the reading and writing culture in Uganda and provide school-children with entertaining but educational stories to which they can relate. Ranzo sells most of his books to schools, with the proceeds used to publish more titles. However, he also donates copies to more impoverished areas. Excluding textbooks, there are only about 20 books published in Uganda annually. According to a study last year by Uwezo, an initiative aimed at improving competencies in literacy and numeracy among children aged six to sixteen years in East Africa, more than two out of every three pupils who had finished two years of primary school failed to pass basic tests in English, Swahili or numeracy. For children in the lower school years, Uganda recorded the worst results. RELATED POST: Who Could Succeed Museveni? Growing up in the 1970s and 1980s, Ranzo was privileged to have a grandfather who had a library and attended a private school that held an after class reading session. He was a particularly avid fan of Enid Blyton’s Famous Five series. “But Mum was a nurse and she wanted me to be a doctor. I wanted to pursue literature and she told me ‘no you can’t do that’, so I did sciences,” says Ranzo, stressing that literature, which remains optional in secondary school, is not taken seriously in Uganda. Furthermore, many local publishers do not see writing fiction as profitable. “They’d rather publish textbooks and get the government to buy them,” Ranzo explains. His books are available in two central Kampala bookshops for 8,000 shillings ($3). But in the past 15 months fewer than 20 have moved from the shelves, while he has sold over 3,000 to 20 schools in three districts. Saving Little Viola, his first book in which the female protagonist, Viola, was introduced, was published in 2011 by NGO Lively Minds. The story ends with Viola being saved by her best friend from two men who want to use her for a ritual sacrifice. UNICEF funded its distribution to 36 primary schools across Uganda as part of a child sacrifice awareness programme. The primary aim of the Oasis Book Project is to encourage reading, although Ranzo admits he would like people to discuss his stories, which have themes close to his heart. Children being forced into work, the theme of The Little Maid, is something he has witnessed himself. “Many kids are brought from villages to work as maids in homes in towns or cities, and the treatment they are subjected to is terrible in many cases,” says Ranzo. His next book, The White Herdsman, which will be released in 2014, deals with the impact of oil production on communities, a timely subject for Ugandans with oil production expected to start in 2016. The book tells the story of a village where water in the well has turned black after an oil spill. A witchdoctor blames the disaster on an albino child. Ranzo’s stories have been welcomed at Hormisdallen Primary, a private school in Kamwokya, Kampala. English teacher Agnes Kasibante, speaking to Think Africa Press, praises the book’s impact. “It’s actually a big problem in Uganda, most children don’t know how to read. At least those books give them morale to continue loving reading,” she says. Ranzo has also penned Cross Pollination, a collection of fictional stories for adults about the spread of HIV in a community. According to a recent report, Uganda may not meet its target to increase adult literacy by 50% by 2015. “I’ve worked in a big multinational company where people have jobs but they can’t write. Reading can help develop this,” says Ranzo, who is currently attending the University of Iowa’s 47th annual International Writing Program (IWP) Fall Residency. Jennifer Makumbi, 46, a Ugandan doctoral student at Lancaster University, is one of a new generation of Ugandan authors. She won the Kwani Manuscript Project, a new literary prize for unpublished fiction by Africans, for her novel The Kintu Saga. She said Taban Lo Liyong’s description of Uganda as a literary desert was “heartbreaking, especially as in the 1960s Uganda seemed to be poised to be a leading literary producer”. “But perhaps it is exactly this description that is pushing Ugandans to write in the last ten years,” she continues. “Yes, we have not caught up with West Africa yet but… there are quite a few wins.” In recent years, two female Ugandan authors, Monica Arac de Nyeko and Doreen Baingana, won the Caine Prize for African Writing and the Commonwealth Writers’ Prize respectively. Makumbi’s Kwani prize adds her to a list of eminent Ugandan authors.